Starting the test drive with a dead battery? No bueno. It is a bit unfortunate that this test drive had to start on a negative note. 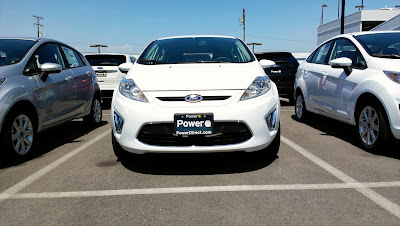 After finding the sportiest Fiesta available at the time, the salesman led us to a 2012 model year car rather than a 2013. 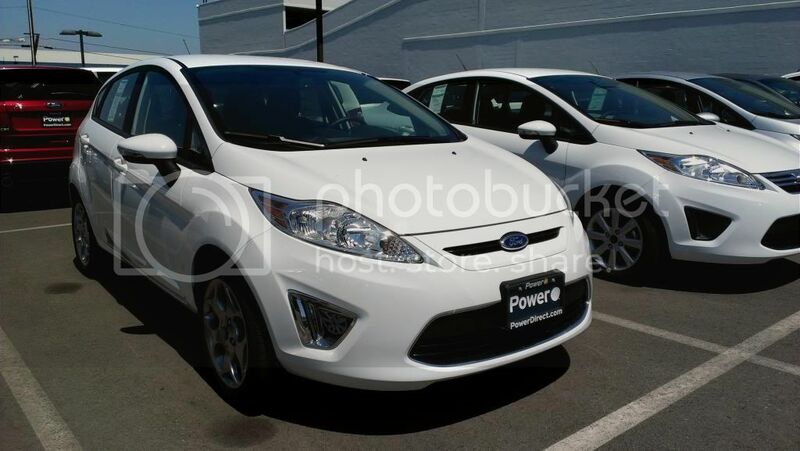 Why they still had a 2012 Fiesta on their lot this late into 2013, I am not sure, but I just went with it anyway. As the salesman proceeded to start the car, the engine refused to turn over. After a quick battery test, my fiancee and I were informed that the battery had died and that the salesman would have to jump the battery. 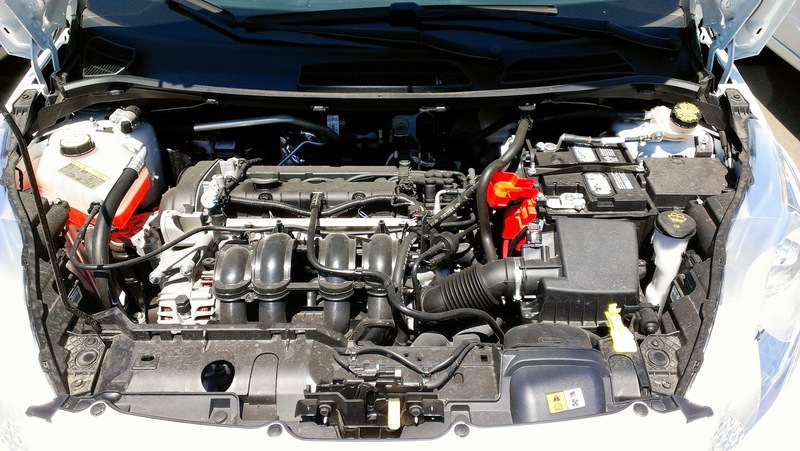 While I am not sure if the dead battery was a fault of the car itself or the dealer not taking care of their inventory, the car was eventually jumped and running and our test drive got underway. While looking over the vehicle, I had expected the Fiesta to be similar to the Focus SE we had as a rental a while back in Sacramento. The car itself looks decent overall, but there was something a little unsettling about the front end of it. For whatever reason, it looked a bit out of place with the rest of the car. I think it might have something to do with the upper part of the grill having a small slit for an opening and the Ford badge being so tiny compared to the Focus. It almost looks like the car is glaring at you or trying to give you the evil eye. Of course, the Fiesta and Focus are two entirely different cars, and I would be spending most of my time behind the wheel, so I tried to not let the front of the car bother me. Despite my high hopes for the Fiesta SES, my experience with the Focus SE and Focus ST left me with pretty low expectations of the interior. I was glad I kept expectations low. Just as with the Focus SE, interior quality was not all that great. Plastic pieces felt cheap, hollow and hard, and the supposedly "leather wrapped" steering wheel felt more like it was plastic wrapped. And just like the Focus SE, the Fiesta SES suffers from "cluttered stack" syndrome - the entire center stack was littered with buttons. 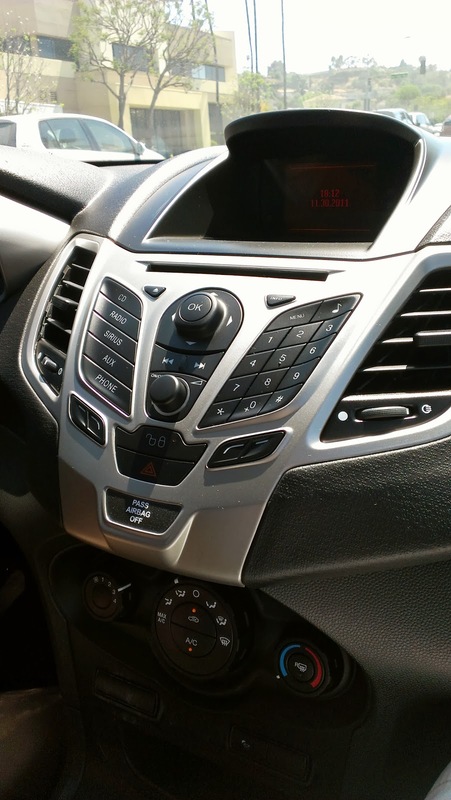 Had this car come equipped with the MyFord touch system like in the Focus ST, my opinion on the cluttered center stack would be different, though not necessarily better as that system has plenty of its own issues to answer for. I suppose the only redeeming quality of the car's interior was probably the seats, which were comfortable and reasonably supportive. For a car that is supposed to be the sportier model in the line up, it certainly does not feel like it. Power from the 1.6 liter "Duratec" inline-4 is decent and accelerates the car at a reasonable pace. The six-speed automatic could use some work though as upshifts were perfectly fine, but downshifts were slow and clunky. While having the ability to manually select gears would have been nice, I am not totally sure it would have fixed the slow and clunky downshifts. At least Ford decided to add the ability to manually select gears with their automatics in the 2013 and 2014 models. Handling was...decent. No real surprise there. A lot of manufacturers today define their "sport packages" as merely an appearance package, and the Fiesta SES was no exception. The fancier 16 inch wheels and rear spoiler certainly make the car look sportier than its lower trimmed siblings, but they seemed to do nothing to actually make the car actually drive sportier. Handling is on the softer side and the car rolls quite a bit during hard cornering. It might have just been me, but it felt like the car wanted to understeer a lot if you tried to throw it into a corner with any zeal, and the steering wheel's lack of communication did not make this car handle very confidently. For a subcompact, the Fiesta's cargo capacity is actually quite dismal. Seats up, expect the Fiesta to gobble up about 15.4 cu.ft. of cargo. With the seats down, that space only increases to 26 cu.ft. The car's lack of cargo space could be attributed to its extremely limited rear passenger room. It was pretty scary sitting in the back knowing that I should wear a helmet for my own protection as the slightest bumps threatened to give me a concussion. 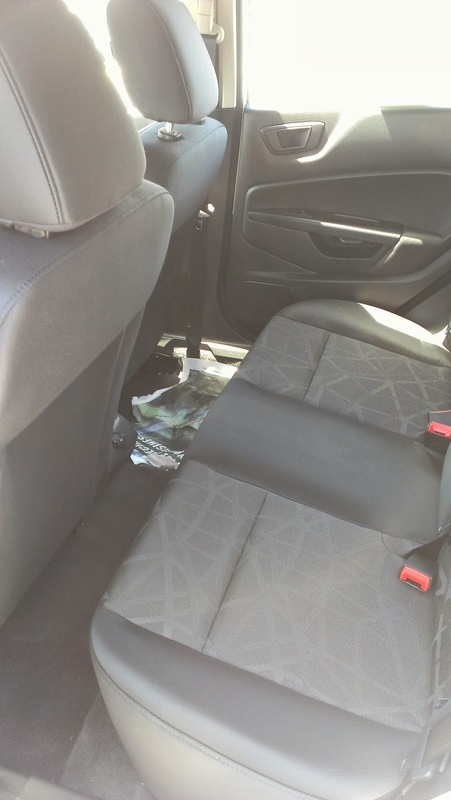 With its competition routinely offering far more cargo and rear passenger space, this car might be a hard sell for someone looking for a small car with the ability to haul lots of stuff or people. Luckily, its gas mileage is pretty good at 29 MPG in the city and 38 MPG on the highway, so all is not lost on this car. For a car called the Fiesta, it certainly did not make me want to party. Considering the major improvements Ford has made with its other vehicles, the Fiesta was a real let down. I can excuse the interior since the rest of Ford's cars have interiors of roughly equal quality, but the mediocre driving dynamics, clunky transmission and lack of cargo space make this car a difficult sell. Sure, the Fiesta gets great gas mileage, but it seems like EPA figures were all Ford focused on with this car. If the high EPA estimates are all that is important to you, then this is a car worth considering. If you care about more than just MPG bragging rights, there are plenty of better subcompacts to choose from. At first look, there is only really one word I could use to describe the Fiesta SES: plain. Other cars in this category have something that make it stand out, but the Fiesta seemed to lack this defining character, unless you can count the name as a stand out feature. I suppose being plain is better than being outright boring like the Toyota Yaris though. The interior of the car had some neat features that I liked, such as the red colored ambient lighting and two power sockets. The USB port, located near the cup holders, is in an odd place though. It is convenient in that it is easy to access, but at the same time, can be an issue if you have drinks in your cup holder. It could also become a disaster if you spilled your drink. I also really liked that the seats adjusted up and down as well as the usual directions, and the cloth had a fun pattern. Unfortunately, these features do not make up for the cramped interior. Not being that tall, it felt fine to me, but I could tell that West Brother was a bit uncomfortable in the car. The cramped quarters also means not a lot of cargo space either. Even with the seats down, there did not seem to be that much space for cargo. Where am I supposed to put all my art supplies? The Fiesta's dash design was very reminiscent of the Focus we tested in Sacramento: cluttered. Buttons were everywhere on the dash. Had there not been buttons on the steering wheel, controlling the radio would be an extremely difficult task. The number pad to the right of the center dash was also a giant mess. It is supposed to be used as both radio preset controls and as the number pad for the Bluetooth phone functions. This mess of buttons definitely requires you to stop the car in order to do anything with them, otherwise you could get confused to what you are trying to do. Driving the car was pretty good. Power was smooth and the transmission shifted very smoothly. The one thing that did bug me was how the car would seem to roll back slightly when accelerating from a stop. I am not quite sure what caused this, but it is definitely something you would not expect unless you were on a hill. Another thing that bugged me was how light the pedals felt. 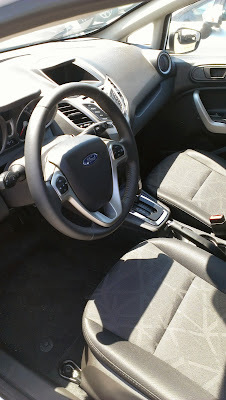 My Fit's gas pedal is already pretty light, but the Fiesta's pedal felt like stepping on a feather. The brake pedal was also uncomfortably light. This makes braking a bit of a shaky affair. Overall, the Fiesta was just OK. While the power was fairly smooth and it had some nice interior touches, everything else just seemed average. This is not a car that really stands out much and had I not seen TV commercials for it, I may have never even known about the car. Had I not already bought my Fit, I really do not think that this would have been a car I would have considered. *Special thanks to AutoNation Ford in Torrance for letting us test drive their car.